Mr Sitoh Yih Pin holding a press conference at the Kallang River ABC Park, outside the PAP branch office, yesterday. The informal session was in keeping with his preference of eschewing PAP bigwigs in favour of focusing on "earning the trust of and winning over residents". 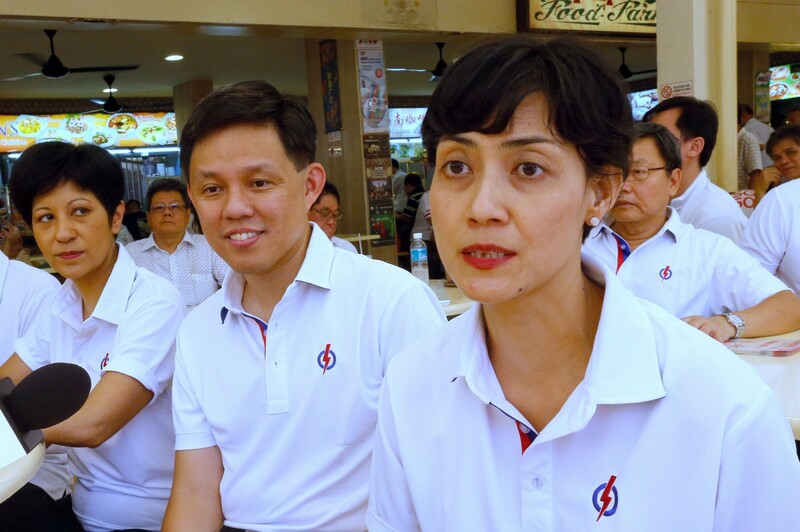 The People's Action Party (PAP) MP for Potong Pasir is expecting a tough fight for the constituency in the coming general election. "When you won by only 114 votes the last time, and when you have lost twice, you take nothing for granted... 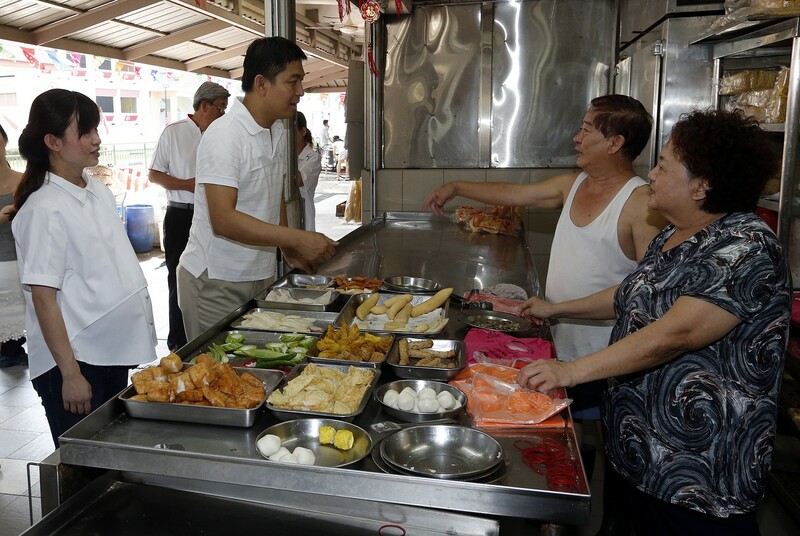 Whether it's a two-cornered fight or a three-cornered fight, I think our chances of winning are 50-50," said Mr Sitoh Yih Pin yesterday, as he announced that he will be defending his seat in Parliament at the next polls. Although a first-term MP for the Single Member Constituency (SMC), Mr Sitoh is already a battle-hardened campaigner when it comes to the polls. 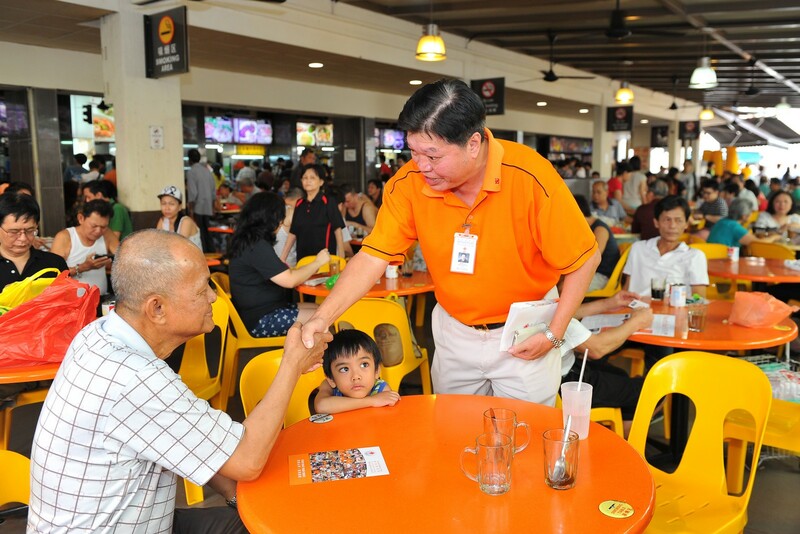 He contested twice - in 2001 and 2006 - and failed on both occasions to prise Potong Pasir away from veteran MP Chiam See Tong's iron grip on the estate. Mr Sitoh finally broke his duck in 2011, narrowly beating Mrs Lina Chiam, the wife of Singapore People's Party (SPP) chief Mr Chiam, by a mere 114 votes. 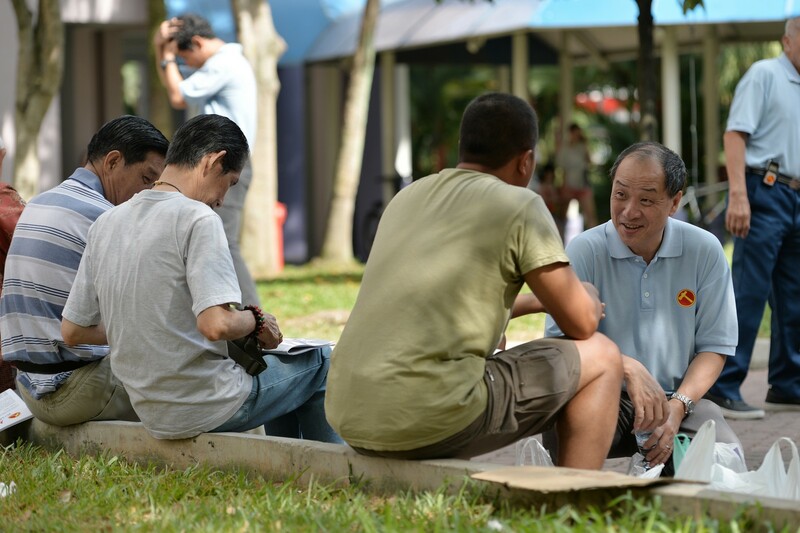 "Dr Ng Eng Hen has informed me that I will be fielded in Potong Pasir again," he said yesterday at a press conference held at the Kallang River ABC Park just outside the PAP branch office. "I'm very happy about that." 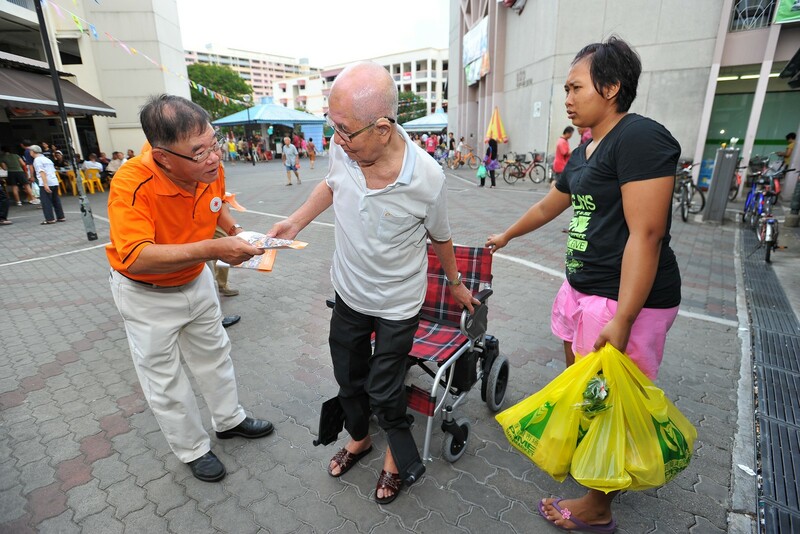 Dr Ng, who is the organising secretary for the PAP, said last week that the party would introduce its candidates from Aug 12 "till National Day Rally or so", spread out at a steady pace to allow residents time to digest the announcements. He said yesterday this has proceeded well and achieved the purpose of providing more information to residents. By Sunday, when Prime Minister Lee Hsien Loong delivers his Rally speech, the PAP would have presented the slate of its candidates except for a few remaining GRCs. Mr Alex Yam, executive director of PAP headquarters, said introductions will then pause for two to three days to give Singaporeans a chance to digest the Rally message. Potong Pasir, the smallest electoral ward here with just 17,389 voters, could be the only constituency facing a three-cornered fight. 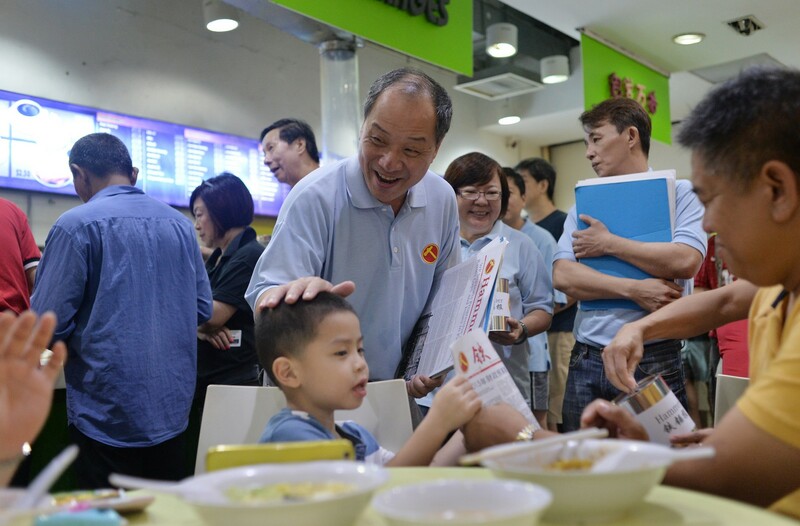 Besides Mr Sitoh and Mrs Chiam from the SPP, lawyer and former National Solidarity Party secretary-general Tan Lam Siong has also said he plans to contest there as an independent candidate. Mr Sitoh's informal, solo announcement yesterday by the river was in keeping with his playbook of eschewing PAP bigwigs in favour of focusing on "earning the trust of and winning over the residents". 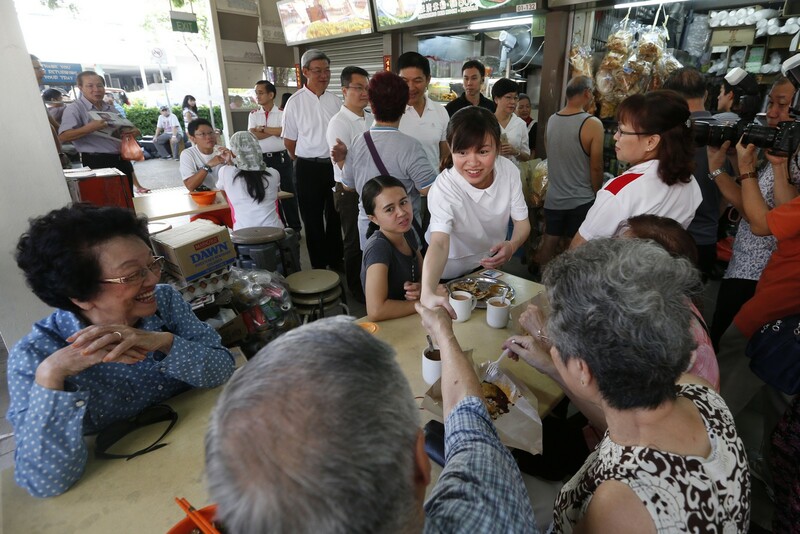 Potong Pasir voters had, in earlier general elections, rejected big-money promises by the PAP, and turned their noses up at ministerial endorsements. In 2006, for instance, they spurned an $80 million upgrading package dangled by then Senior Minister Goh Chok Tong and returned Mr Chiam to Parliament with an even bigger winning margin than at the previous polls in 2001. For Mr Sitoh and his team, work started in 2011 as soon as the election results were announced, and he said he was happy to have fulfilled the promises he had made to residents at the last hustings. 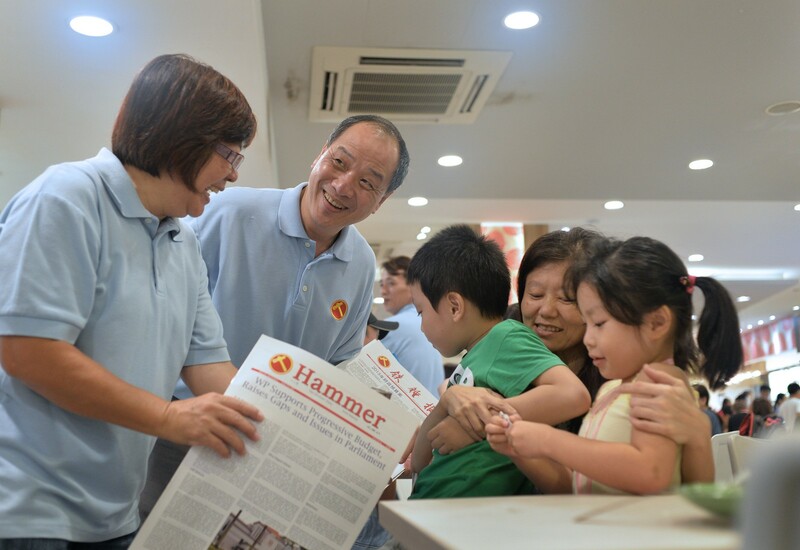 Besides kicking off lift upgrading across the estate, he has also set up a family service centre and more childcare centres. He has also introduced an initiative that provides low-income families with food supplies and an education incentive award for students living in the ward. His campaign manifesto for the next five years is ready, he added, but it will be unveiled only on Nomination Day. 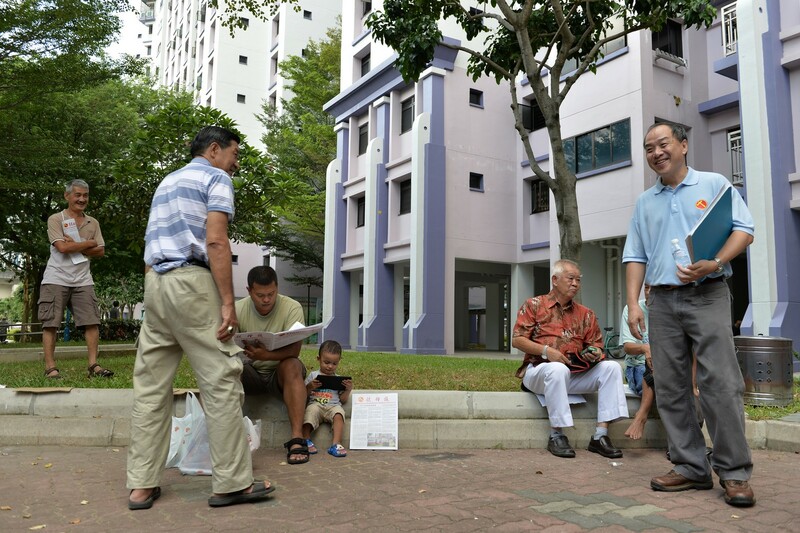 However, he let on that residents can look forward to a new bus service plying through Potong Pasir estate during peak hours in the mornings and evenings. "Am I confident of a bigger margin? 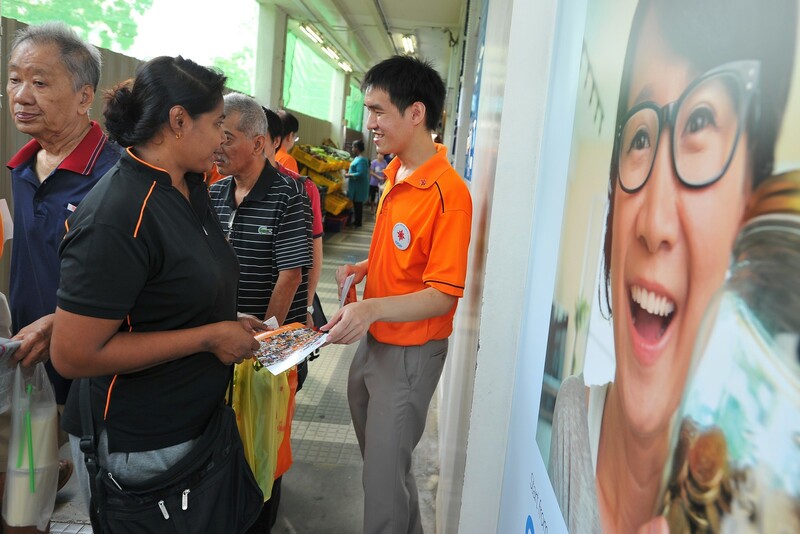 No, I don't dare to dream about it," he said when asked about the mandate he hopes to receive from Potong Pasir residents at the next polls. "I'll work as hard as I can and I hope our voters can give us another opportunity to serve them." 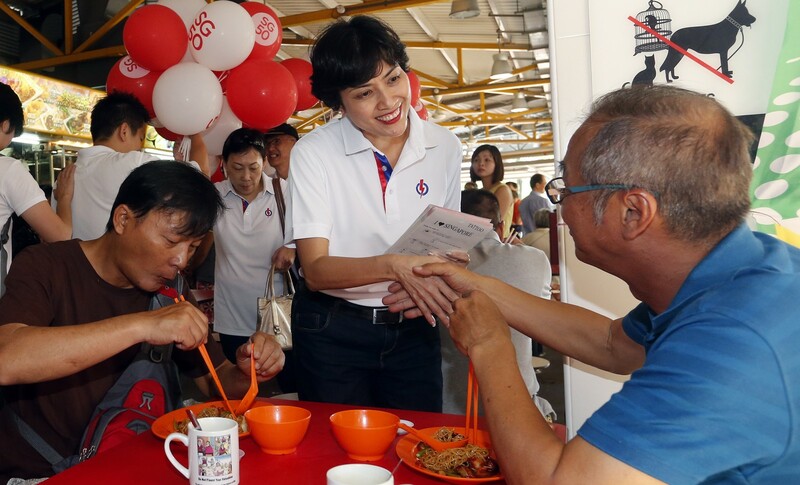 3 potential candidates from the public sector have been accompanying PAP MPs at community events in recent days, including Ms Rahayu Mahzam, 35, who was in Bukit Batok East with Jurong GRC MP Halimah Yacob on Sunday. Asked if she would stand as a candidate, she said: "I would be happy to serve if chosen." 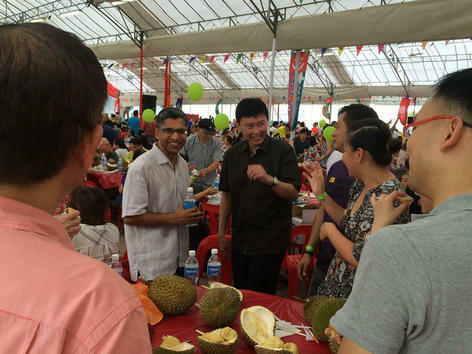 Second Permanent Secretary for Trade and Industry Chee Hong Tat, 42, was with Bishan-Toa Payoh GRC MP Hri Kumar Nair and residents at a party on Saturday. Mr Chee was chief executive of the Energy Market Authority and principal private secretary to former prime minister Lee Kuan Yew. 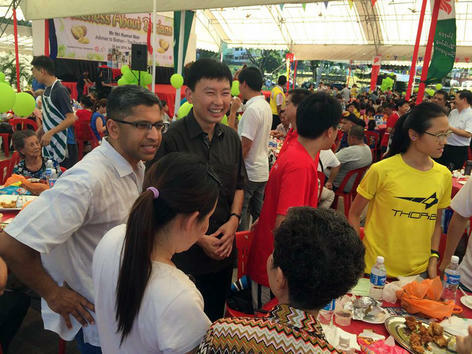 On Sunday, Assistant Commissioner of Police Melvin Yong was at Punggol North, attending a street parade to celebrate racial and religious harmony. Mr Yong, director of the police public affairs department since last June, was previously commander of Clementi Police Division. 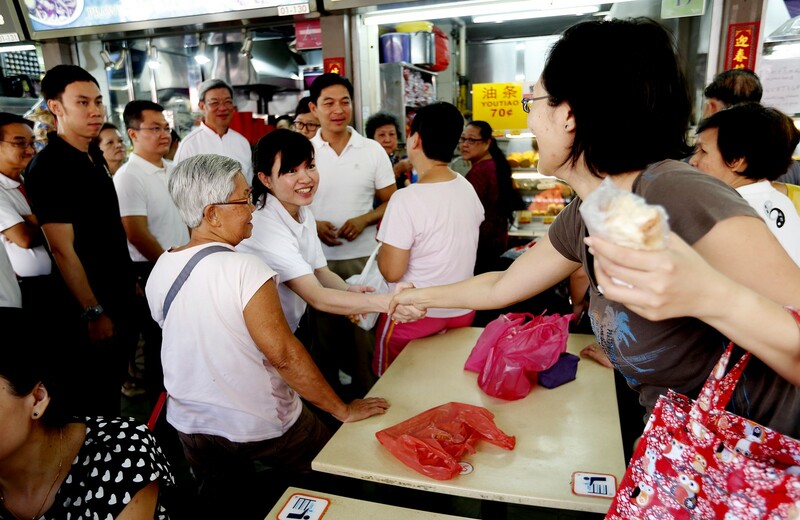 First-term Member of Parliament Tin Pei Ling is all set to go solo in the next elections in her MacPherson ward, which will no longer be part of Marine Parade GRC. 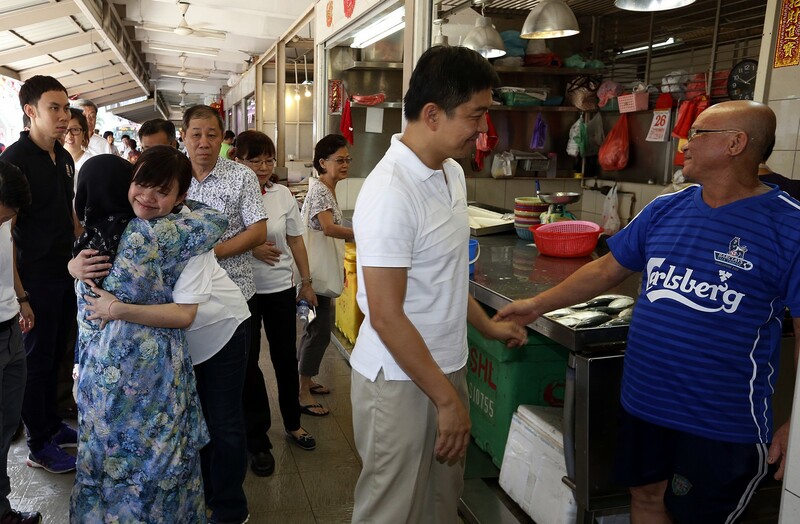 The signs pointing to this were clear when she visited two markets in her ward on July 26 with fellow Marine Parade GRC MP Tan Chuan-Jin, two days after the Electoral Boundaries Review Committee released its report. 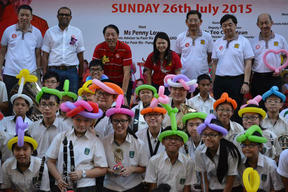 Mr Tan said: "Although it's a SMC, we will continue to work closely with Pei Ling. She's been working hard here. 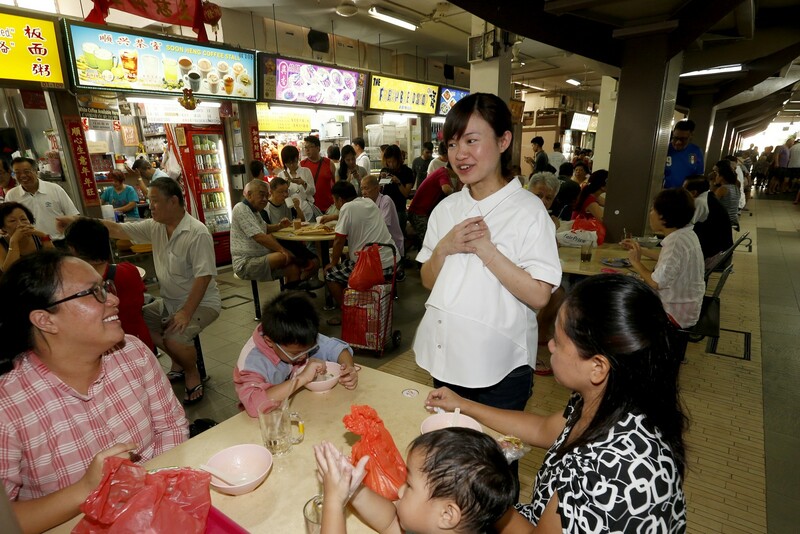 From the responses of residents and many of the shopkeepers here, it's very encouraging." 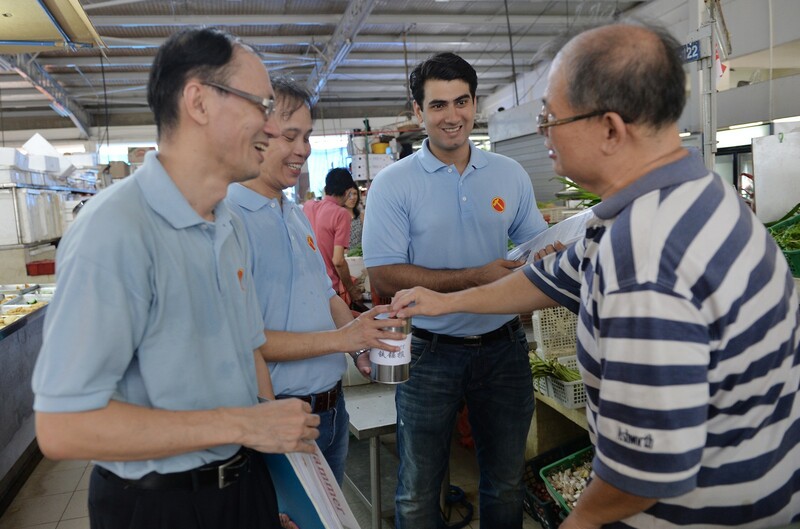 Asked again if Ms Tin should contest, he said that "certainly, the Prime Minister will have his own reasons for letting Pei Ling run as an individual". One of the electoral boundaries committee's recommendations was for MacPherson to be carved out of Marine Parade GRC as an SMC. 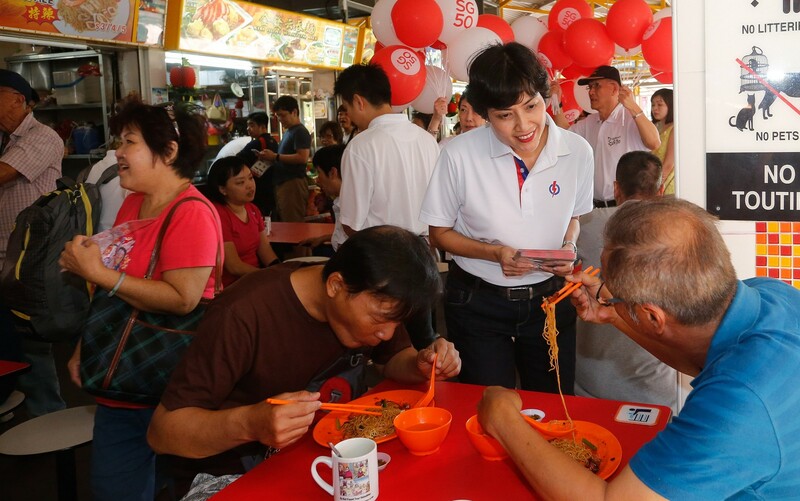 If fielded, Ms Tin is likely to face several challengers as the Workers' Party, National Solidarity Party and Singaporeans First party have all expressed interest in the ward. Many took selfies with Ms Tin. 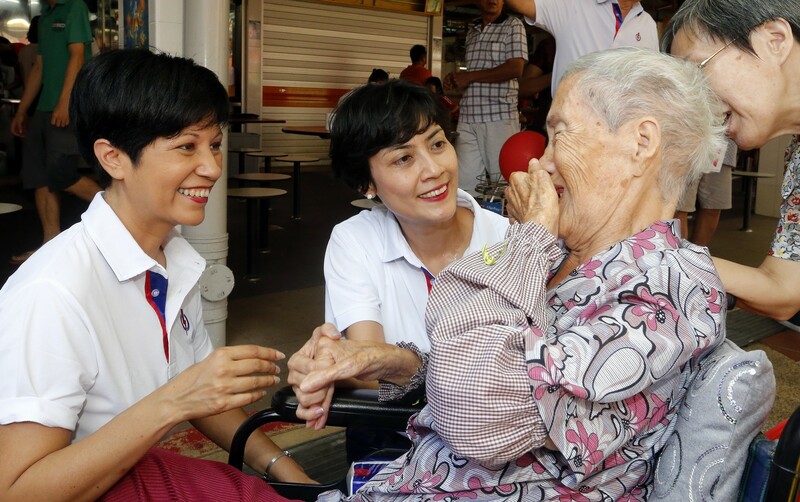 Among them was retiree Lam Mui, 69, a Still Road resident, who said: "She's a very good MP, many people think so." 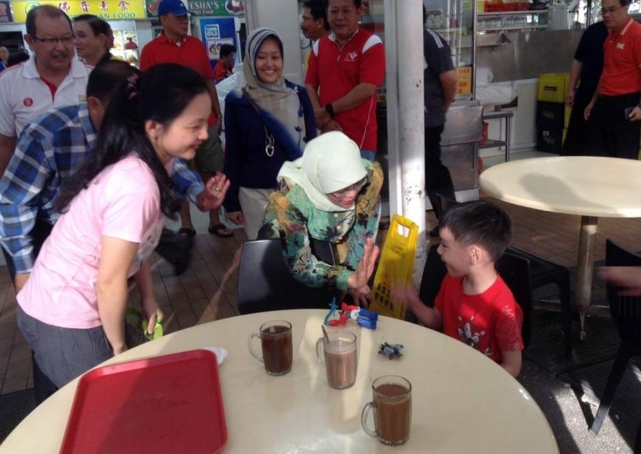 Former public servant Joan Pereira greeted residents and diners at Bukit Merah View Market and Food Centre on Sunday morning (July 26). 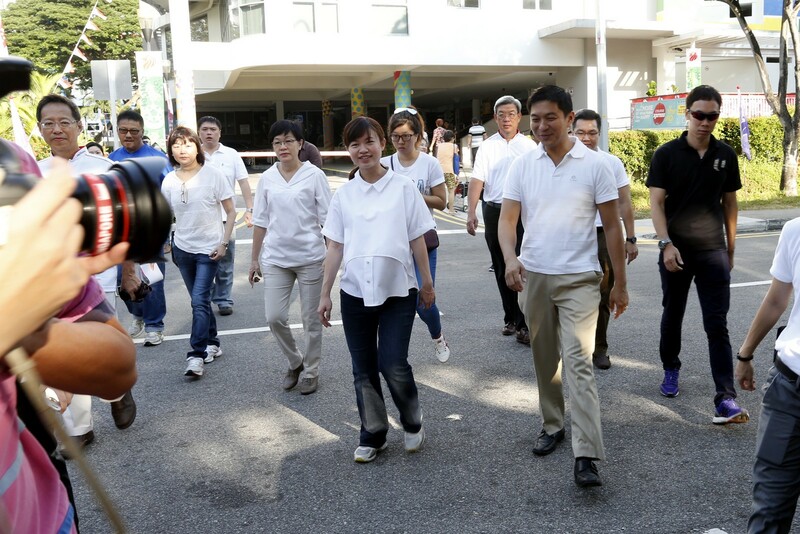 She was accompanied by Minister in the Prime Minister's Office Chan Chun Sing, Senior Minister of State Indranee Rajah, MPs Lily Neo and Chia Shi-Lu and about 30 People's Action Party activists. She started her career in the People's Association at Queenstown Community Centre in 1992 and worked there for over a decade. And from 2007 to April this year, she was the PA's director of Family Life and Active Ageing - which put her in contact with a constituency that has one of the highest percentages of elderly residents. "I find deep fulfilment in serving the elderly. Indeed, there is a joy when I help them," she told reporters after the walkabout. The GRC's fifth MP was former prime minister Lee Kuan Yew, who died in March. 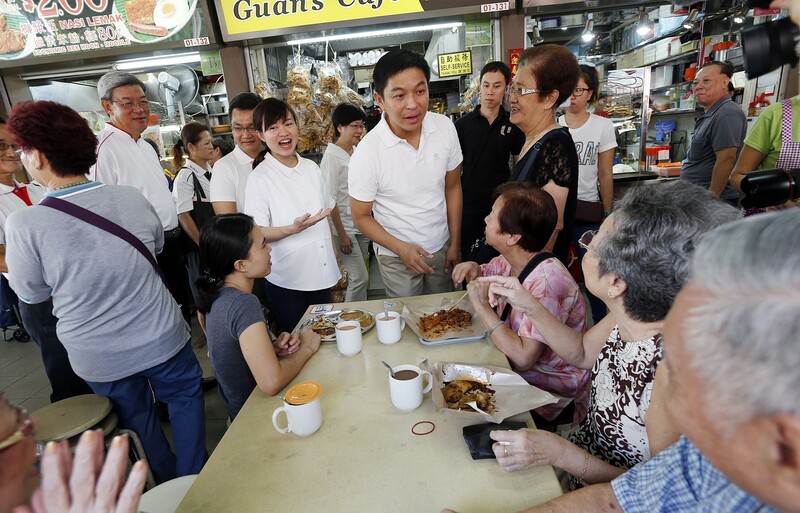 The National Solidarity Party (NSP) was at its old stomping ground of Tampines on July 26, where it has contested in every election - bar one - since the constituency was formed in 1988. 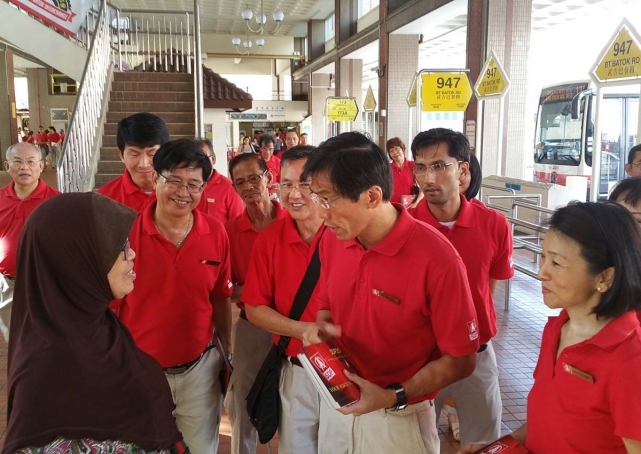 Twenty party members and volunteers turned up for the three-hour walkabout in Tampines West - among them two who are in their 20s: Ms Kevryn Lim and Mr Jan Chan. 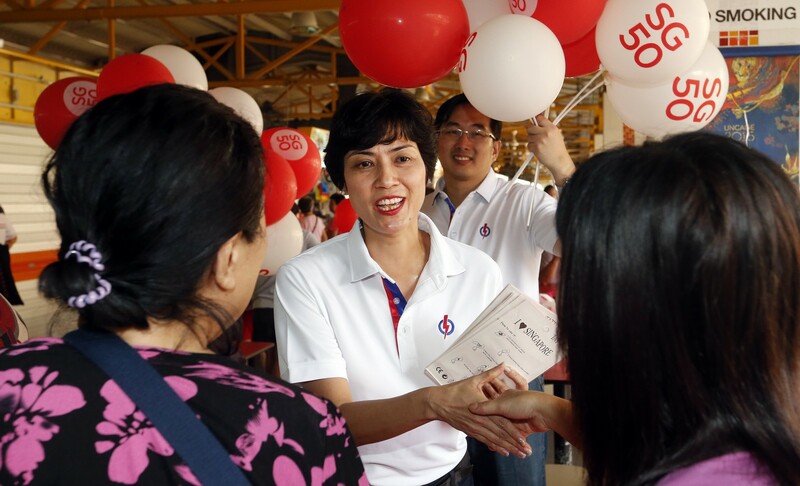 Party leaders declined comment on potential candidates for the next hustings, but NSP's star catch at the 2011 election, Ms Nicole Seah, was also in her 20s when she was fielded in Marine Parade GRC. 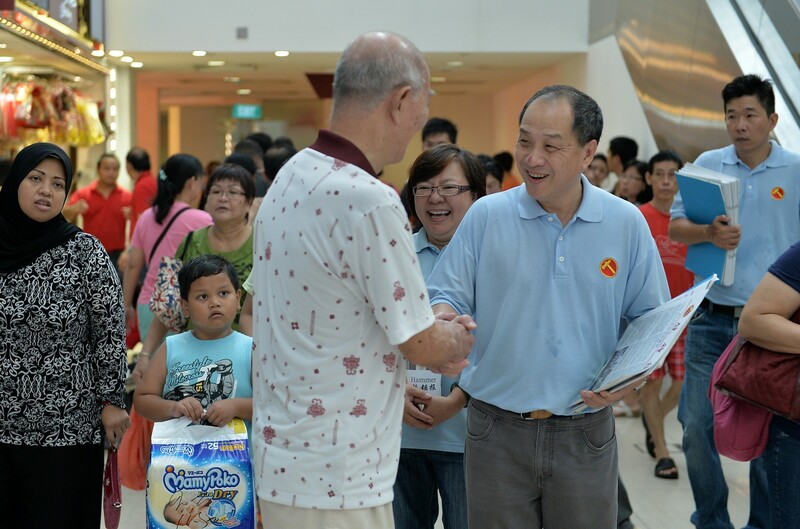 NSP president Sebastian Teo said he hopes the party's persistence in Tampines will win voters over. 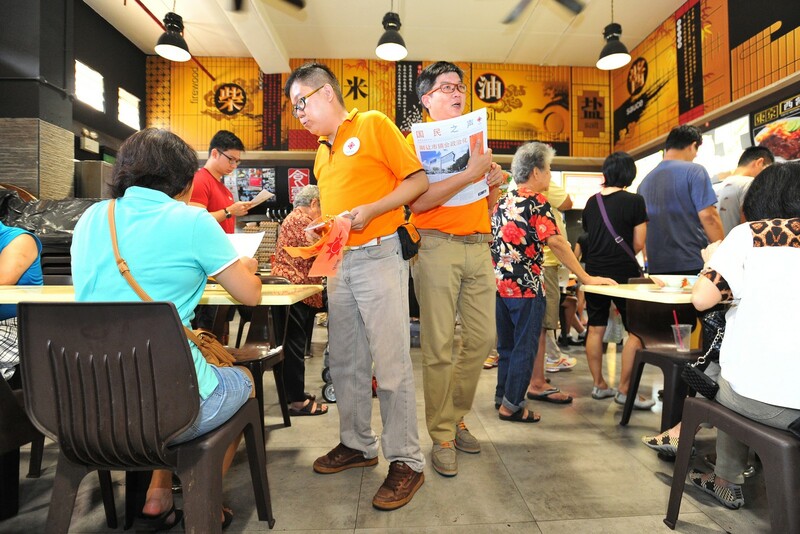 Party chief Tan Jee Say said the party has set up its elections office in Tras Street in Chinatown, and is keen on Marine Parade, Pasir Ris-Punggol and Tanjong Pagar GRCs. 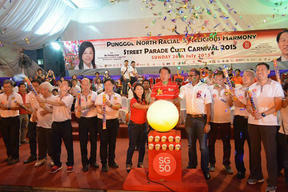 The Workers' Party will contest five GRCs and five SMCs, party chairman Sylvia Lim told The Straits Times. 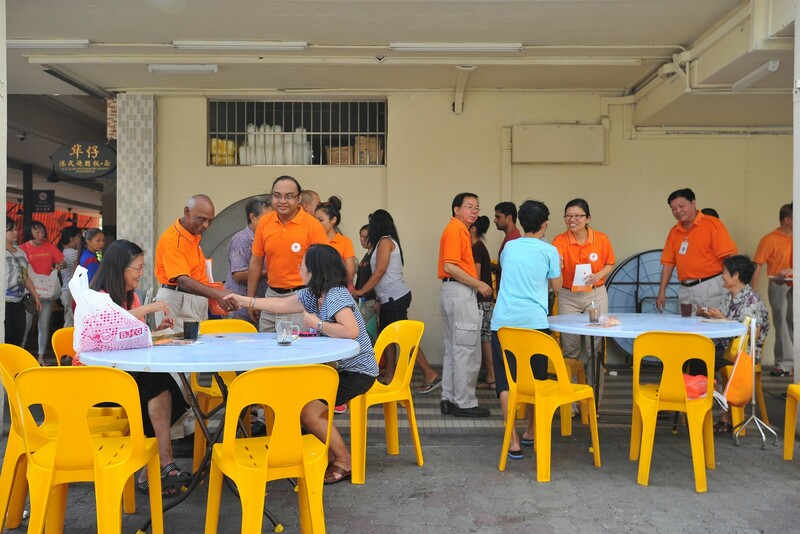 Other than Aljunied GRC, Hougang SMC and Punggol East SMC, which are currently held by the WP, the party will field candidates in East Coast, Jalan Besar, Nee Soon and Marine Parade GRCs, as well as Fengshan, MacPherson and Sengkang West SMCs. Mr Low said the party had been working the ground in Marine Parade GRC as well as Joo Chiat SMC, which will be absorbed into Marine Parade. "As a matter of principle, the Workers' Party will contest where we have contested before," he said. 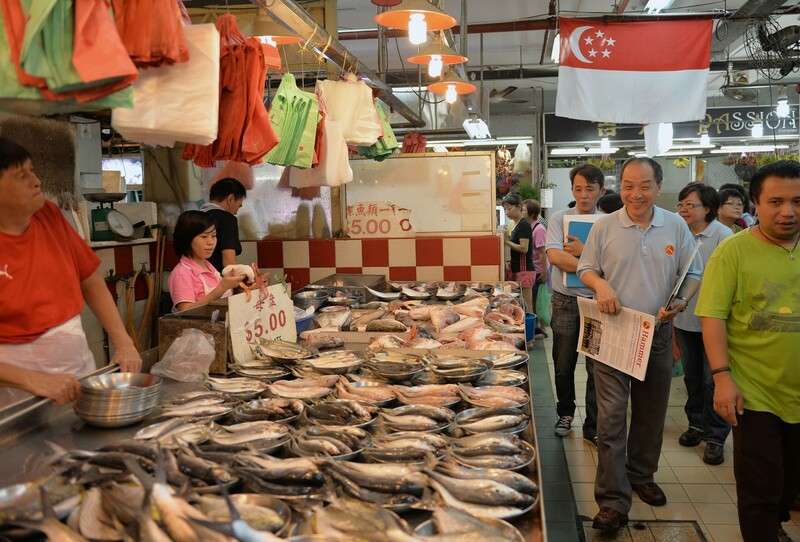 "In this case, Joo Chiat is being redrawn into Marine Parade. 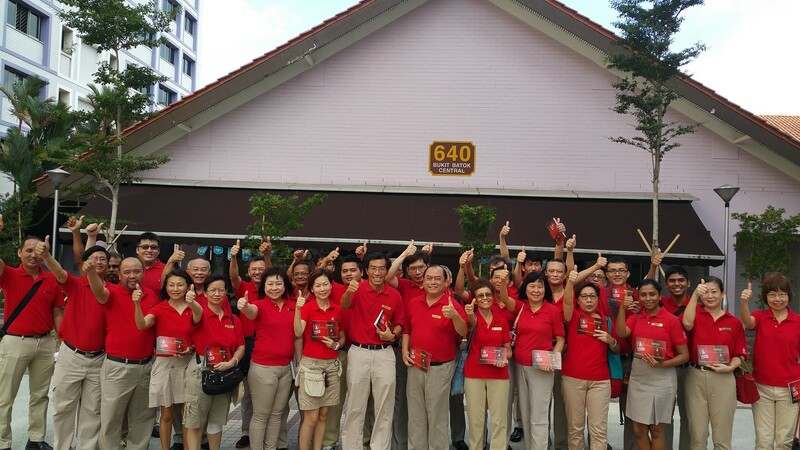 We don't want to disappoint voters in Joo Chiat. We want to offer them a choice again in this election," Mr Low said. 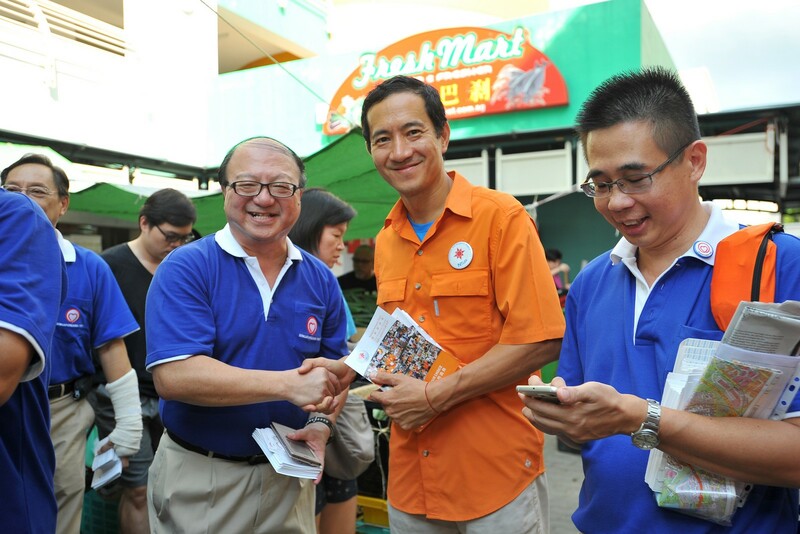 The Singapore Democratic Party plans to contest the Bukit Batok single seat and is looking at fielding "a very good candidate" there, said its secretary-general Chee Soon Juan. The Electoral Boundaries Review Committee, in its report, recommended a rise in the number of elected Members of Parliament from 87 to 89. They will come from 16 GRCs, up from 15, and 13 SMCs, up from 12. There will now be 6 4-member GRCs, up from two, and 8 5-member GRCs, down from 11. 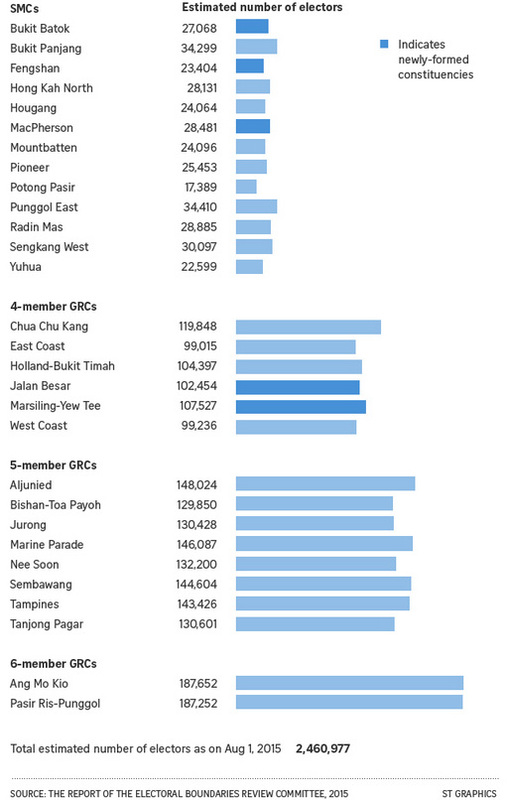 Ang Mo Kio GRC and Pasir Ris-Punggol GRC, helmed respectively by PM Lee and Deputy Prime Minister Teo Chee Hean, remain 6-member GRCs. Moulmein-Kallang GRC, which was won by the People's Action Party team with 58.56 per cent of the votes in 2011, is now gone. Meanwhile, Jalan Besar has returned as a GRC. 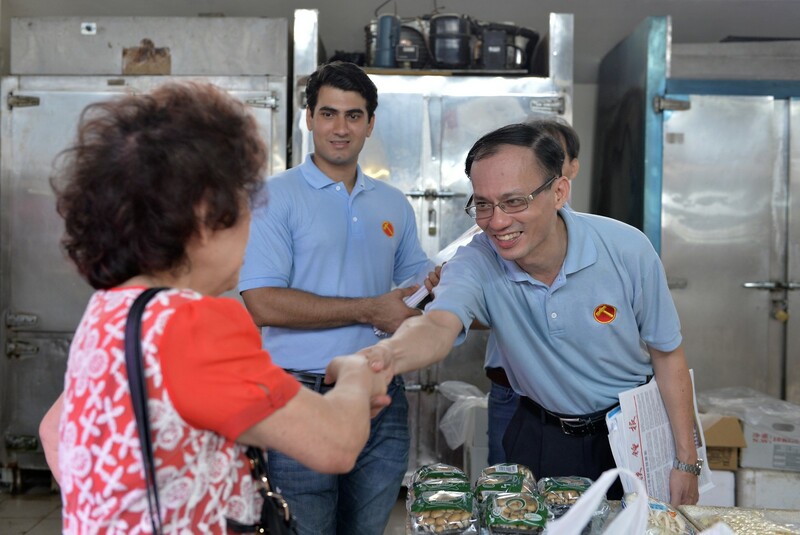 Fengshan is among three SMCs that have been created.Fengshan SMC was part of East Coast GRC in the 2011 election, and has more than 23,000 voters. New in the north is Marsiling-Yew Tee GRC. The change could be to accommodate the population growth in Chua Chu Kang GRC's Yew Tee and Keat Hong wards where 2,500 BTO flats have been added. 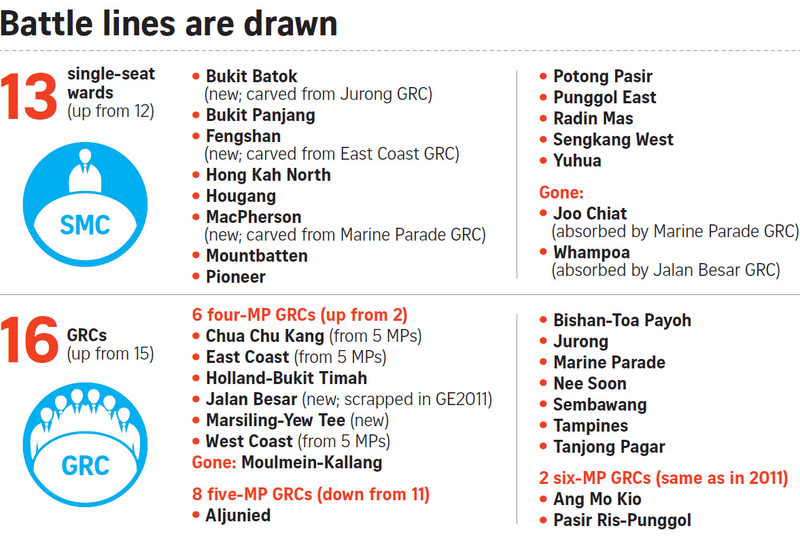 Joo Chiat SMC, which saw a fierce electoral battle in 2011, is now part of Marine Parade GRC. MacPherson SMC, which was absorbed by Marine Parade GRC in 2011, has made a come-back this time. The announcement of the new electoral boundaries have raised expectations that the next general election will be called soon, possibly in September. 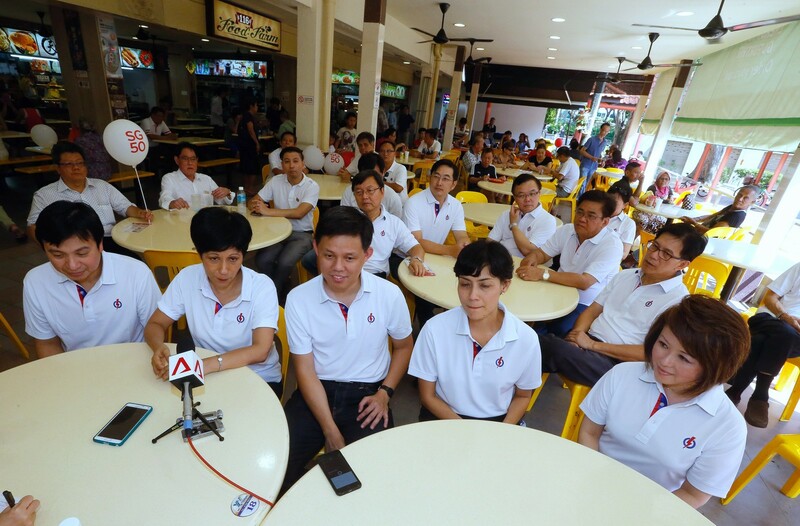 In the days ahead, People's Action Party (PAP) activists and opposition members will meet their teams to step up preparations for the election. The next stage is for Parliament to be dissolved and the writ of election issued. Nomination Day, the start of the traditional nine-day campaign period, is expected to take place from a minimum of five days after the writ. There is then a Cooling-Off Day, which falls on the eve of Polling Day when voters cast their ballots. This article was first published on Aug 18, 2015.